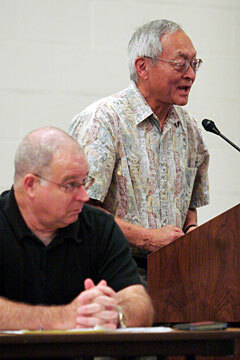 Bob Watada, Ehren Watada's father, spoke yesterday at a panel discussion, "Ehren Watada: Conscience and Constitutionality," at the UH-Manoa Architecture Auditorium. At left is Eric Seitz, Ehren Watada's lawyer. Supporters of 1st Lt. Ehren Watada, the first commissioned officer to face a general court-martial for refusing to fight in Iraq, were out in force yesterday during a public forum at the University of Hawaii. Watada's attorney, Eric Seitz, told the audience of more than 100 people that Watada's pretrial hearing is set for Jan. 4, with the court-martial beginning Feb. 5. Seitz was on a three-person panel discussing the case along with UH law professor Jon Van Dyke and Watada's father, Bob, at the School of Architecture Auditorium. The event was sponsored by the Honolulu Chapter of the Japanese American Citizens League, which has expressed its support for Watada. However, the national chapter of the Japanese American Citizens League has declined to take a position on the case, only supporting a fair trail. Watada is charged with missing movement for not deploying to Iraq with his unit from Fort Lewis, Wash., on June 22. He is also charged with conduct unbecoming an officer and gentleman for comments he made. He faces up to six years in prison. An additional charge of contemptuous remarks against the president was dropped. Military officials and those who oppose Watada were not at yesterday's event. Carolyn Ho, Watada's mother, said in a letter read to the audience, "For some elected officials to claim that this is beyond their purview and Lt. Watada is courageous but should take the consequences for his decision is an outright evasion of responsibility and lack of moral courage." Van Dyke argued that the war in Iraq is illegal and that Watada was correct in opposing the war in accordance with the Nuremberg trials and the United Nations Charter. "We want Lt. Watada to stand up to this sense of a culture of impunity and insist that the law that we would apply to others would also be applied to us," he said. Watada's father recently returned from a three-month national trip to raise support for his son, stopping in 38 states. Seitz told the audience, "There is really no cogent legal or factual argument to support what the Army is doing here. "By charging Ehren, the Army is reaching way out there and essentially inviting us to take this case into the federal courts, to take it all the way up to the Supreme Court," Seitz said. John Masunaga, 83, a veteran of the highly decorated 442nd Regimental Combat Team in World War II, attended the gathering to support Watada. "Ehren's standing up for something we all should have stood up for," he said, noting the internment of Japanese Americans. "The time World War II started, we were trying to prove ourselves good loyal citizens." "Sometimes you have to speak up and try to right some of the wrongs," he said. Sixteen other groups also sponsored the Watada event, including local branches of Veterans for Peace and Iraq Veterans Against the War. Watada joined the Army in June 2003 after graduating from Hawaii Pacific University.